So while it’s true I did not quilt this weekend, there were quilting things around me. It has a woven silk checkerboard plate (the decorative top layer of a tutu, go HERE for info about tutu construction from the National Ballet of Canada) hand beaded with a paillette trim. So, patchwork-ish. This was one of his sleeves. The Nutcracker Prince wore this gorgeous piece in Act II: his sleeve was made of six different silks put together in a Seminole patchwork style. And actual patchwork here…if you look at the right side of the picture you can see new fabric was sewn by hand as literal patchwork. So there we go! Even the ballet can have quilting in it. All costumes designed by Paul Daigle and constructed by the talented men and women of the Royal Winnipeg Ballet Wardrobe Shop. No quilting today but I did get to be near fabrics things. The ballet is in town and I am a backstage ninja! What that means is I am working as a dresser, not furniture, but someone who helps dancers with their costumes and changes, any mending and whatever else happens. 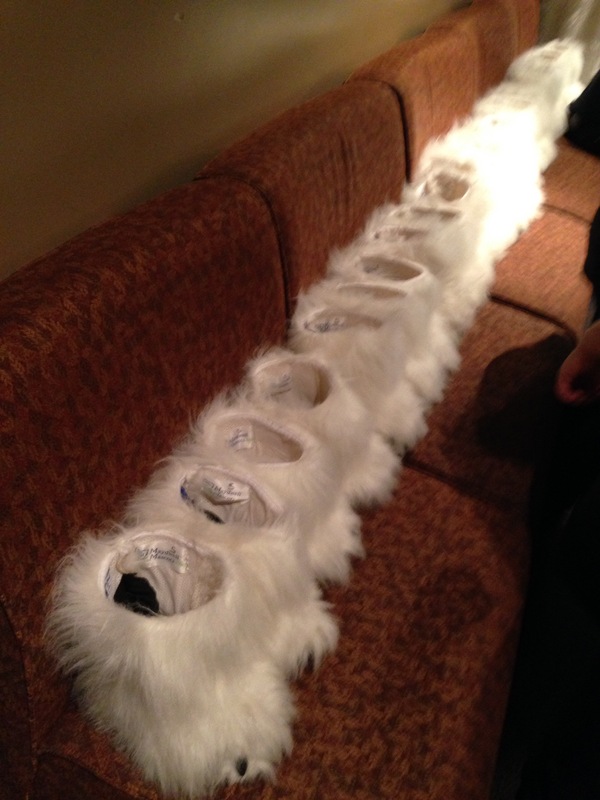 These are twelve pairs of polar bear feet waiting for twelve very excited eight year olds. And I get to do it all again tomorrow. Twice.